Oh how I enjoy the few weeks before Christmas. I delight in the decorated houses, the joy of the young children, the music, and the cheerful greetings. I love hearing from family and friends across the world. This Christmas we shall be traveling to meet up with my boys for a Christmas celebration. What a marvelous time of year! And yet what a challenge! All that commercialism. The pressure and the expectations. It all seems so greedy. Here’s an idea! Let’s turn Christmas around and upside down! We can make the season about GIVING rather than getting. Reaching out doesn’t have to be hard, but a simple act of kindness can make a huge difference. I know this is a busy time of year for most families, so many of these suggestions are SIMPLE activities that are really EASY to do. There are a few that might take longer, so make sure you have room in your schedule before committing. Donate food to your food pantry. Take some time to explain why families might need to use a food bank and then go shopping together. Let the children pick out most of the items. Explain that you want to buy healthy food, but encourage your children to include a few treats as well. If possible have your children accompany you when you drop the food off at the food bank. Save up some change and put it in the Salvation Army bucket. Give to your favorite charity. Choose one as a family and find a simple ways to raise the money. There are some suggestions here. 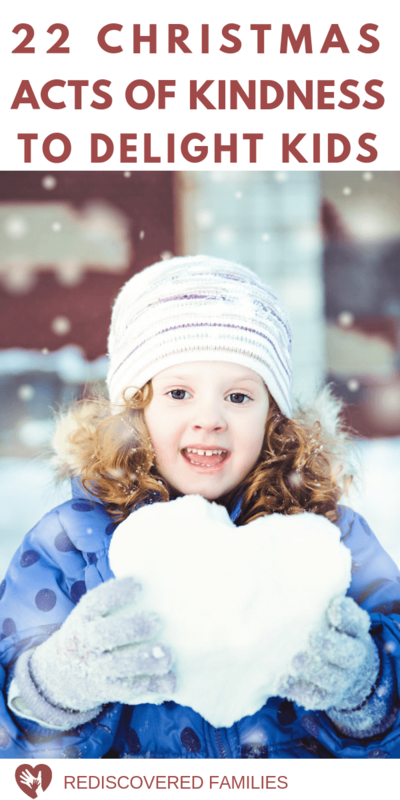 Take part in a local charitable service such as Santa’s Anonymous or Toys For Tots. Alternately assemble blessing bags for the homeless – – If you don’t feel safe or comfortable delivering them yourself, take them to a shelter that helps the homeless. Leave a gift for your mail carrier. 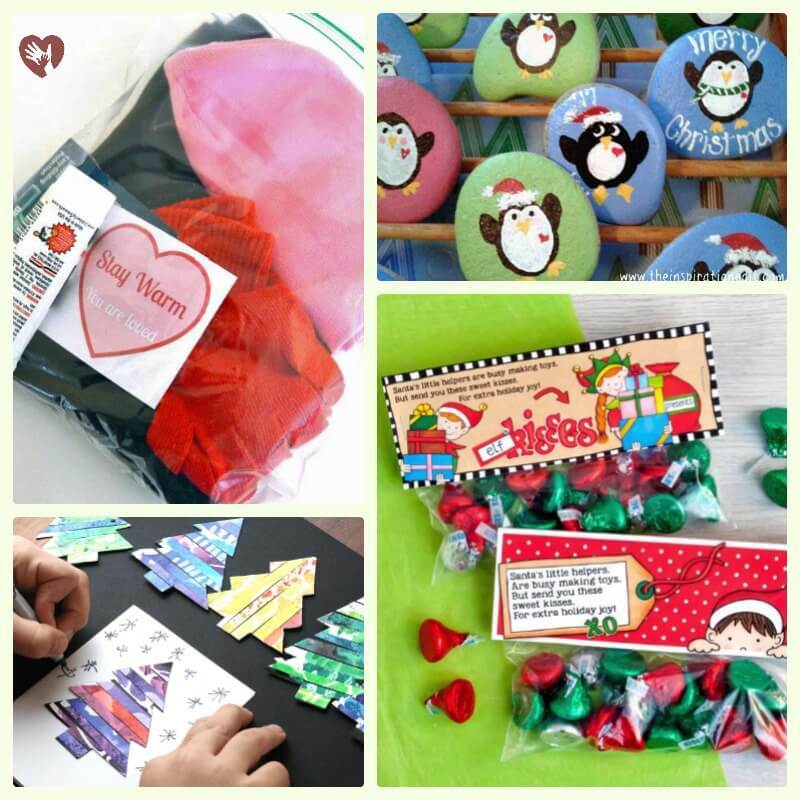 How about these cute elf kisses or these treat bags. Have a family baking party and make your favorite treats. Then give them to people that work for the community, such as nurses, police, and fire-fighters. Write thank you notes to people who go all out to decorate their yard and house with lights. Thank them for lighting up the neighborhood. Volunteer to help someone wrap gifts, perhaps an elderly neighbor who has stiff hands or a young parent that could use the help. Do yard work or shovel snow for a neighbor. If your family attends a religious service at Christmas you might also offer to drive others. There are many people without cars who would appreciate a warm ride to and from these events. Call the leaders of your religious institution to find out if they know of anyone who needs a ride. Invite a single person for a meal. The holiday season can be hard time of year for those who are alone. These might include international students, seniors with no family, or singles that can’t get home. Approach your church leaders, university chaplains, or student services groups to find out who might be facing the prospect of a lonely Christmas. Take a Christmas plant to someone who doesn’t get outside very much. Sing Christmas carols/songs for your neighbors. Offer Babysitting to young families. This time of year can be challenging for young parents. An afternoon of free baby-sitting can be godsend. You can do this as a family as most children enjoy looking after little ones for a short period of time. Make or buy a bird feeder and start to feed to birds in the garden each day. If you have time, why not decorate a tree with edible treats for the birds? Make Christmas cards out of recycled art work and use them to write some notes to nursing home residents. Candy cane bomb a parking lot. It’s simple! Just go around sticking candy canes and a note on car windshields for people to discover. Coffee Cups and Crayons has a free printable to help. Want something even simpler? Candy cane bomb your immediate neighbors! Make some adorable Penguin kindness rocks. Put together coloring book and crayons for children visiting the emergency room at the hospital. To make things easy for you I have created a printable list for you to use. Grab your free printable from the library click here. Download the list. You’ll get the free printable, plus join my bi-weekly newsletter! Just click here to subscribe and enter the library. 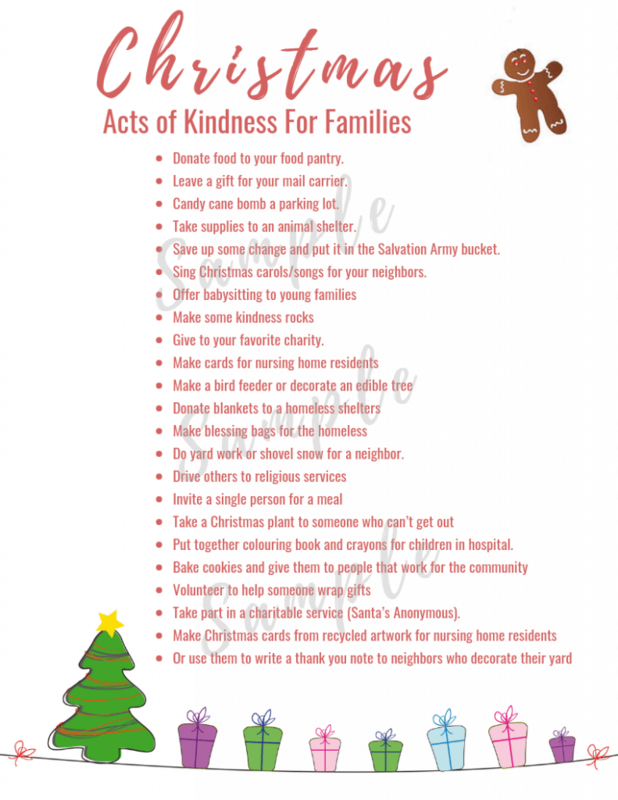 Print out the list and keep it on your fridge as a reminder to include some kindness this December. You could also read it through with your kids and ask them to choose a couple of ideas. The countdown to Christmas can be a wonderful time for families. It is a chance to make memories and have fun together. Adding in some acts of kindness will turn this holiday into a time of giving and that is a powerful way to ward off the gimme monsters. How will your family give to others this December? 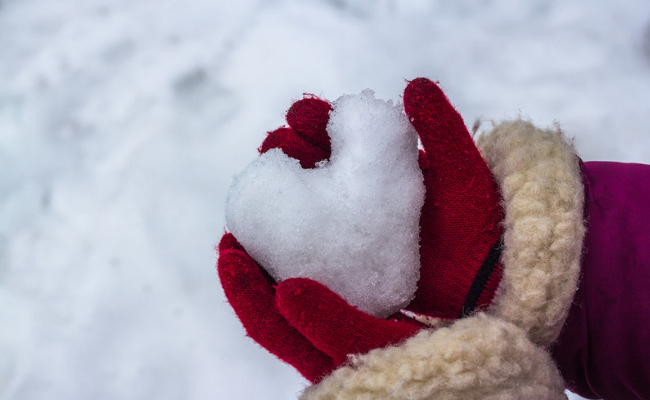 Have you found ways to make this holiday into a time of giving? Please share your ideas in the comments below. Did you enjoy this post? Was it helpful? Please share and tell a friend! Drop me a comment if you’re going to try some of these tips. Bonus points if you leave a comment! What a wonderful list. It’s true, Christmas is so commercialised now I fear many have lost sight of what Christmas is really about. Some great ideas and it’s true it’s what we should all be doing as at least part of our Christmas. Some lovely ideas there. I have planned on getting the children to make cookies for the neighbours. THat’s a gret idea Karen. Kids love baking…well at least mine did! All really good ideas for giving back. Great posts, drawing attention to giving back. The old addage, “it is better to give than receive” has faded away somehow. We have been picking up the restaurant tab for senior citizens dining alone. It does our heart good. No one but the waitress knows and we hope it blesses her too. Ohh I love that idea…it’s like a secret kindness mission! These are wonderful! My daughter loves baking Christmas cookies but there are only so many we can eat. I love the idea of sharing them with others – such an easy way to bring joy! It states that I need to have a password to enter the library. I have subscribed to you twice on both my emails but it has never asked for me to create a password. What should I do? Hello Ashley, I have e-mailed you a number of times, but never got a response. I suspect my e-mails may be going into your spam/junk folder. Could you check?